I am going to start this post with the boldest of statements – this candle is the best candle I’ve ever owned. I’ve always been a candle addict and there isn’t an evening that goes by where I don’t light a candle as it’s just part of my relaxation routine before bed. 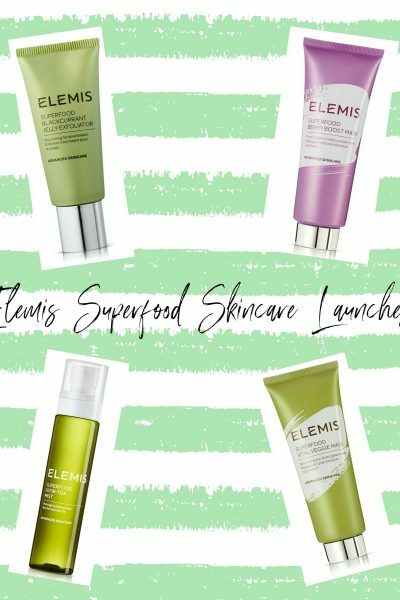 I’ve tried so many different candle brands but you can’t beat discovering a new brand, especially when they’re a niche artisan brand which aren’t very well known. The Luxe Candle Co is a brand I hadn’t heard of until trying one of their candles, but their website instantly caught my attention as their candles looked so luxe. 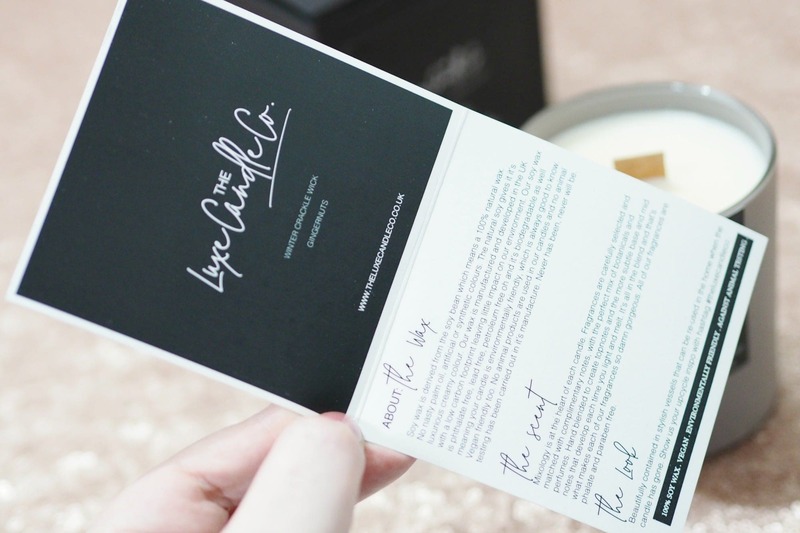 I feel like everyone needs to know about The Luxe Candle Co, and I’m going to explain why…. The Luxe Candle Co was founded by Clare Fletcher and Simon Alker, and they’re a couple that live in Saddleworth with their children which is where their candles are individually hand poured. 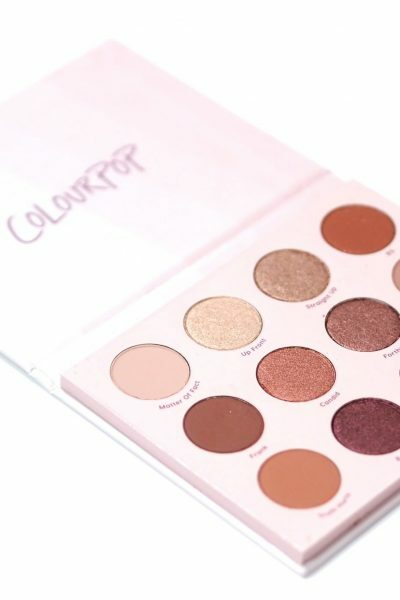 They created the brand due to their love of candles, and the ritual of lighting a candle and self care that comes with candle light and the psychology of scent and emotion. The brand offers luxury materials, the finest oils and ethical and eco-friendly wax. 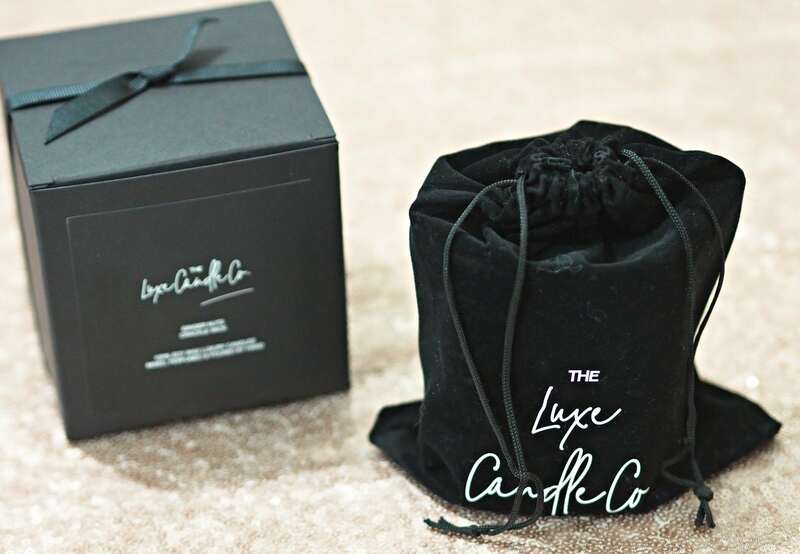 There’s something so personal about The Luxe Candle Co and I feel like that’s why they’re so special and their products aren’t mass produced in a factory, and they offer a little slice of luxury as the candle is presented within a velour drawstring bag – something I’ve never experienced with any other candle brand. I was kindly given one of their Christmas scents and I was blown away by the scent which could be smelt through the box, and through the postage box it arrived in. I’ve never found a candle which gives off a scent so strong you can smell it through a box before so it’s evident The Luxe Candle Co use a very high percentage of oils within their candle blends. The box arrived beautifully wrapped in leopard print paper complete with a bow and I don’t know anyone who wouldn’t be wowed by the seriously luxurious presentation. There are a total of four Christmas fragrances to choose from; Mistletoe Smooches, Ginger Nuts, Gold Frankincense & Myrrh and Spiced Orange Mulled Wine. 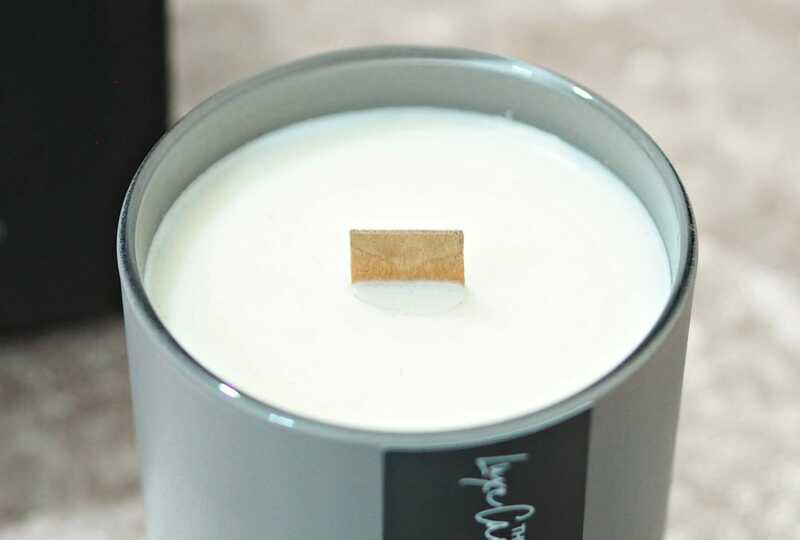 I have the The Luxe Candle Co Christmas Ginger Nuts Candle £25 and it smells insanely good. 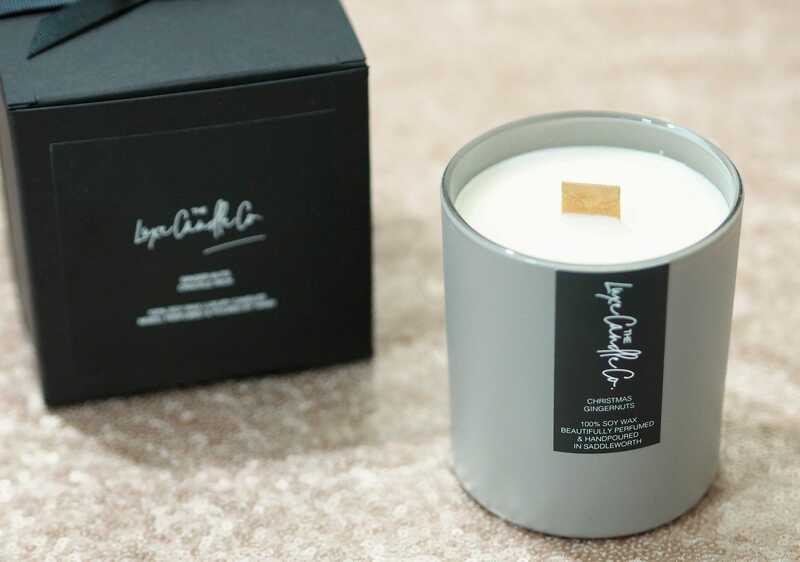 Something unique with the The Luxe Candle Co Christmas Ginger Nuts Candle, is that there’s a fragrance card nestled within the box explaining everything about the wax and the fragrance. 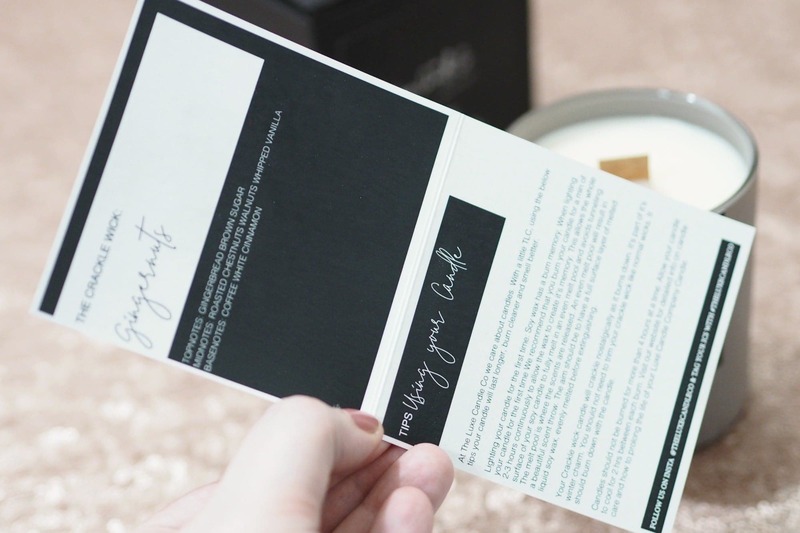 The card also mentions some tips on how best to use your candle, and this particular candle has a burn time of 45 hours. 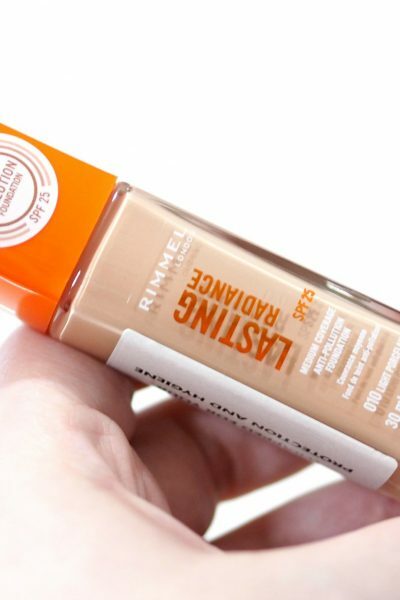 Top Notes: Gingerbread and Brown Sugar. Mid Notes: Roasted Chestnuts, Walnuts and Whipped Vanilla. Base Notes: Coffee and White Cinnamon. 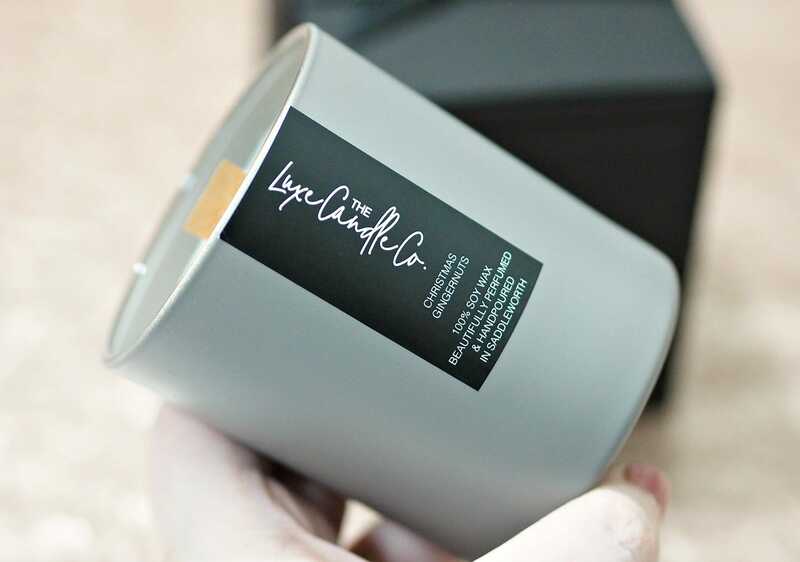 The The Luxe Candle Co Christmas Ginger Nuts Candle is housed within a matte slate grey glass jar and this particular candle is one of their Winter Crackle Wick Candles so when it’s burning, the wooden wick makes an amazing cracking burning wood fire sound. The throw of the scent even when the candle’s not burning is incredible and everyone that comes into my house comments on the amazing scent – even my postman and it wasn’t even alight at the time. The scent is so beautifully layered and not a straight up ginger nuts scent, but it’s such a warm and spicy scent which couldn’t be more perfect for Christmas. It burns very cleanly too with very little wax left around the edges so there’s no wastage but I’ll be absolutely scooping any left over wax and using it in my wax melt burner as I love the scent so so much. I have never loved a candle as much as I love this one, it’s the best candle I’ve ever had and I am desperate to try their other scents as the Ginger Nuts candle has blown me away. If you love candles or know someone that does, you need to try The Luxe Candle Co.
I’d love to know if you’ve tried any of The Luxe Candle Co candles before?